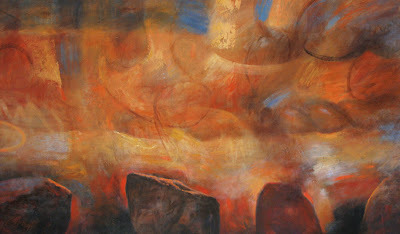 Oil on canvas, 54" x 96"
This large painting in the Heaven and Earth series has been on my painting wall since early December. The sustained work has been a good counterpoint to the daily paintings. I could go on re-working it forever, but think I'll call it complete...whatever that means. A photo was taken after each day's work. The videos below document the process from beginning to end. Click the arrows on the toolbars at bottom right to toggle the videos full screen. wow Don! This is amazzzzing!! In my mind, Rahina, the theme gives me room to explore in a very loose way thoughts on earthly and spiritual, concrete and abstract, real and imagined, etc. Thanks for your thoughts on this, Sheila. The world can sometimes feel like a pretty scary place, so I guess the painting reflects that. Once again, I am awed. This painting and the video of its progress is like reading a very good book. Thoroughly engrossing! What a great thing to say, Sam--thanks! You completely boggled my mind this time Don. The finished piece is absolutely heavenly. I watched the videos with my jaw dropped. You gave your self so much room to obliterate and return. You are truly an inspiration! Wow, pretty cool. It was interesting to watch the progress on that. I've tried some abstract lately and knowing when to stop is difficult. Thanks, Stephanie. Yes, one of the challenges is that working abstractly is usually more oriented to process than goal. It's difficult to know when you've "arrived". Of course that's true for realist painting too, as attested by all the paintings I've over or under-worked.